Bluehost is a leading web solutions services provider. Since their founding in 2003, Bluehost has continually innovated new ways to deliver on the mission: to empower people to fully harness the web. Based in Orem, Utah, Bluehost provides comprehensive tools to millions of users throughout the world so anyone, novice or pro, can get on the web and thrive. 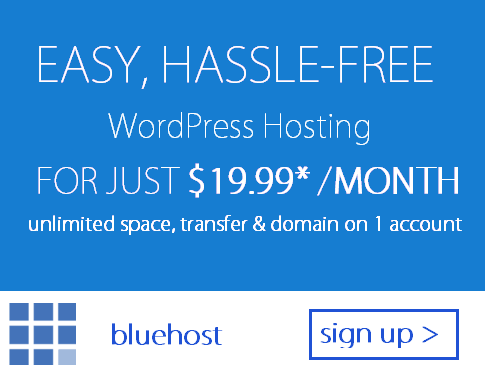 Bluehost believes in WordPress and their partnership has allowed them to support it for over 10 years. Bluehost in-house team consists of dedicated WordPress experts to provide the best support whenever you need answers. Bluehost even dedicate engineers on their development staff to full-time WordPress CORE development. No one powers WordPress better or understands it more than Bluehost does. It starts with the commitment to deliver a powerful solution you can count on. reliability, and functionality you need. Set up WordPress with just a click and manage all your installations from one place. Bluehost makes it easy so you can start building your website immediately. Try it and love it, or get a refund at any time. With Bluehost you’re never locked into a contract and there are no hidden fees or penalties. Bluehost domain manager makes it easy to track, update, transfer, purchase, and administer all of your domains in one place. Plus and Business Pro accounts support unlimited add-on and parked domains, subdomains, and even domestic and international domains. Bluehost automatically create daily, weekly, and monthly backups of your entire account. Easily restore your complete data with the click of a mouse, or use our optional PRO backup service to restore specific files and databases. Bluehost technology identifies websites using excessive resources and temporarily re-assigns them to isolated systems. This defends your website performance and mitigates the risk normally associated with shared servers. Built on cPanel, bluehost has designed an enhanced interface with additional tools that make it easier to manage your websites, domains, emails, files, and more, all from one central location.